I was chatting with Adam and Scott about this earlier and they brought up a good point which was how many people are really going to sell their laptop 3 years later? My previous laptop I gave away because it wasn't worth the hassle to sell. Adam also brought up the standard economic supply vs. demand question. 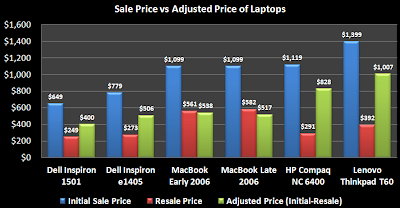 Three year old Mac laptops may have a high demand because Macs are in style, whereas I speculate the supply of them is much less compared to their PC counterparts. Three years from now, after what I've personally noticed as a spike in Mac laptops, the recoup % may be lower because there will be a larger supply and less of a demand. It's definitely hard to predict. In either case I am 100% satisfied with my mac-lappy, and I highly recommend. Oops, must have deleted too much there. That last phrase should read, "and I highly recommend them." same thing, but bigger hdd 640gb, and .2ghz less processor for $1299 w/free shipping. You tell me which one's cheaper. Oh and mind you, i'm not wilin out on OSX, I love OSX... just wish Apple would release OSX to PC's so this pompous charade of "I have a mac, cause it's better" will go away. I look at things from a hardware perspective, then I look at the prices. Performance is another key element. OSX runs beautifully, is stable and much better than XP/Vista I agree, but if Apple doesnt' release OSX to the majority of PC's, Apple will still be stuck in a niche of vanity players while Windows 7 will dominate the market once again. Apple has every right to be shaking in their small 5% niche right now, only to make that niche smaller win Win7 comes out. We can sword fight about who's better all we want, but the proof is in the pudding and that is Windows dominates Apple. Apple will only fail until Jobs gets over his pride and vanity issues and releases OSX to the PC's. Cheers on your article, however it did not impress me.